TVT Tramec double output worm gear box. The solution for twin screw extrusions of cheese or butter, or other machinery requiring two synchronous counter rotating outputs. 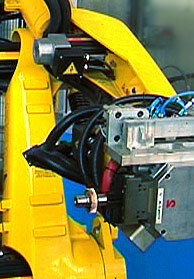 One IEC C-face or shaft input worm drives two worm wheels, for variable speeds a type N variator is often added for 6~1 variable output with simple turn dial control. 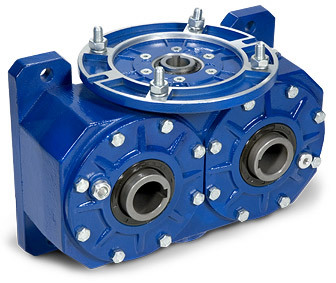 This series is reliable, long lasting, and available in four sizes (based on mm between outputs) 135, 150, 170, and 230 and five ratios 7.5, 10, 28, 40 and 80/1. The price for a VSF.2.USC is essentially a little more than the price of two comparably sized worm gear reducers. 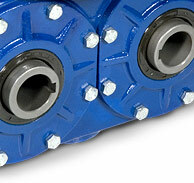 Housings & Motor Flanges of aluminum, finished inside & out in polyester epoxy blue RAL5010. Worm - Machined of alloy steel, hardened & ground. Bearings ISO Precision Metric Tapered roller bearings of 52100 vacuum degassed steel. E-Mail TVT Engineer Select and purchase a VSF2 series on-line. 1951002151 VM230 Double output worm gear reducer from Tramec S.r.l. made in Italy. 2095542001 VM170 Tramec Riduttori size 170, worm gear reducer, gearbox with two outputs (double Output). 2093546011 VM135 Small riduttori made in Bologna, Italy, double output worm gear reducer for cheese, pasta, butter making. 2094511001 VM150 7.5 200/24 Double output worm gear reducer. 2094546001 VM150 40 160/19 worm gear reducer with two output counter rotating synchronous rotation.